I've heard all kinds of comments about the restaurant Blu Rovinj: from favorable comments praising Blu's food to calling it pretentious place with mediocre food. But there is one thing about the restaurant Blue that everybody agrees about – Blu has the best location in Rovinj. We are talking seafront here, and not just any seafront, you can literary eat here with your feet dipped in the Adriatic sea. Blu is located in a residential part of Rovinj, some 3 km west from the old town, not far from Amarin Resort. The restaurant is right at the seafront, with plenty parking spaces available in a shade of a thick pine forest surrounding the restaurant. Lots of locals and tourists come to this area to swim and sunbath. On approach you immediately notice a nice seafront terrace with round tables, white tablecloths, and a white canopy protecting it from the sun. Restaurant is located just few steps away. Architecturally, Blu is an interesting place. It actually doesn't have an indoor seating in a classical way, with fixed roof, four walls, doors and windows. Blu's interior is actually courtyard terrace, with high walls that give certain structure to the place, and canopy stretched roof. Sea facing front has large floor to ceiling windows, and unobstructed view over the sea, and even a tip of Rovinj's old town. Blu is an upscale restaurant, and I would say an incorrigible romantic place due to its nice setting barely few steps away from the sea. That's said, the restaurant is also on an expensive side. We visited the restaurant Blu back in August at 1 pm when the sun was spicy, and the heat was simply too much to take. Even the nice sea breeze couldn't cool us off from the August heat. To be completely fair, eating anywhere else in Rovinj in these conditions, would be even worse. At Blu one at least gets that perfect sea breeze. The restaurant wasn't busy at that time, and we got a wonderful seafront table, right next to the large window, with a beautiful view over the sea. The table is set flash with the window, meaning that you get to use only three sides of the table. At first it seemed a bit bizarre to eat next to each other rather than facing each other, but with that view, you quickly forget your table manners. At Blu, they have a cover charge, which can be a bit annoying (to me at least). But for the cover charge they do bring you a rosemary focaccia. I liked their focaccia a lot, and didn't eat bread at all, although we were also served a basket of freshly baked rolls. For starter we ordered a choice of seafood appetizers. We haven't ordered full portions, but among the three of us, we've ordered a portion and a half, that we shared. The staff was nice enough to split each dish we've ordered in three. We tasted five different appetizers, and they were all beautifully presented on a long white plate. Our appetizers included: octopus salad, cod spread, sardine in savor, squid salad, and salmon and cheese roll. I wasn't really impressed with our starters. I mean there were nothing wrong with them, but they were rather forgettable. I don't know why Croatian chefs keep insisting on salmon, that you can't find in Croatian waters, and it's inevitably imported. Anyways, another annoying thing is that cod spread. There are two companies in Istria that make a cod spread, and you can say right away that it's industrial, that it contains lots of margarine, and that it's simply poor thing to serve on a plate in an upscale restaurant. We did however loved our main course. Waiter suggested us to order a fresh dentex fish baked in oven with potatoes and other veggies. It sounded a bit unexciting, maybe too classical, but the thought of a fresh Adriatic dentex was enticing, and we went with his suggestion. Here in Croatia, when it comes to ordering fresh fish (and especially with wild caught fish) a waiter usually brings over a tray of available fish, and let you choose a fish, or just to show you how fresh it is. Fish is prepared whole, and the waiter will always offer to clean it for you at the table. At Blu was no difference, and we did let the waiter remove the head and bones for us, as he simply was able to accomplish this job faster. Fish was grilled in an oven with potatoes. And it was yummy! We've skipped dessert this time, so can't really comment on it. Final verdict: While the food at Blu was good, it didn't really blow us away. However, the location is top notch and that alone should be a reason to stop at Blu if you are in Rovinj. I would recommend you rather to go there for dinner than lunch, especially during July and August, as it gets too hot to eat. Prices are on a higher end, but not exaggerated. All in all, a nice place for a romantic dinner out in Rovinj. 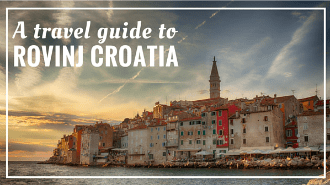 Further reading: If you plan to visit Rovinj, start with our Rovinj Travel Guide. We also wrote a detailed post on best things to do in Rovinj, as well as a post about the best restaurants to eat in Rovinj. For inspiration you can check our Rovinj Photo Walk, and info about the best events in the town, you can find here. We also feature lots of Rovinj restaurants reviews here at our blog. Our favorite restaurants in Rovinj are: Giannino, and Orca. We also like the vibe at Kantionon, and the food is good too. For a fine dining experience, choose Monte in the old town, or Wine Vault in hotel Monte Mulini. Male Madlene is a small quirky place we also recommend. Have a candlelit dinner at the restaurant Lanterna on the island of St. Andrew. We've also covered bars and clubs in Rovinj. What kind of restaurant do you usually look for? Do you value location over the food? What do you think about the restaurant Blu Rovinj? Let us know in comments below.